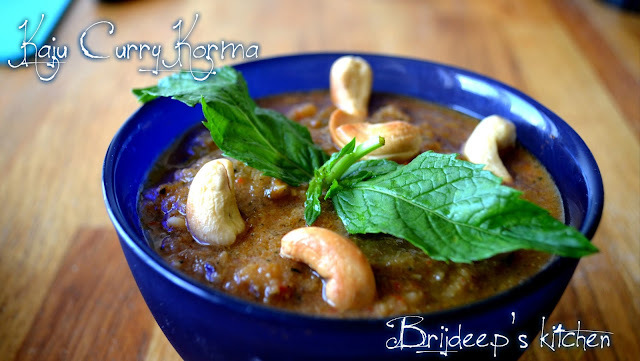 Kaju Curry Korma is a pleasure dish which imparts a wondrous aroma when being cooked, as well as tastes heavenly. 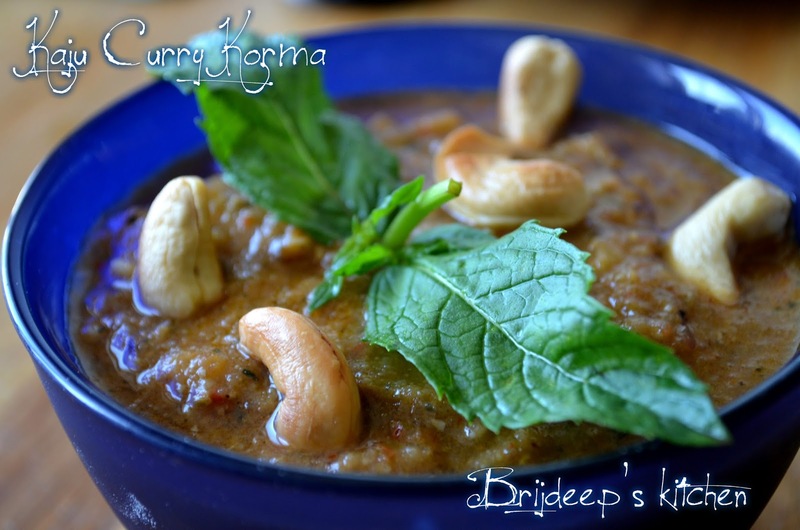 The sweet cashew nuts are lightly toasted in little ghee/oil until they turn a light golden shade of beauties and then simmered in velvety creamy gravy of onions, tomatoes and very special aromatic spice blend. This served as a side dish for us on a Sunday afternoon with Tandoori Chicken. I served this with plain rotis. Also, this curry can be used as a base for many vegetables including kaju curry paneer, malai kofta, lauki kofta and many other vegetarian curries. The specialty of this dish is it is actually very simple to make and doesn't need much time to get ready. This is the original recipe of my mother who once discovered this dish many, many years ago when there were sudden guests and there were no vegetables in the fridge. She told me she prepared this and the guests loved it so much that this recipe became a regular in our home for guests and for special occasions and festivals at home. So this can also be the best choice to prepare when you have sudden guests at home or even when you want to cook something royal and special, something different from the regular menu. Heat oil in a pan and fry half the cashews on a medium flame till they start getting a golden brown color. Drain and keep aside. Add onions and all the dry spices: cloves, cardamom, cinnamon, coriander seeds, cumin seeds, dried red chillis and the other half of cashews to a mixer and grind to a fine paste. Grind using a little water if required. In the same pan, add the butter and add the onion paste. Cook on medium flame till this paste starts getting light brown and the oil starts leaving at the sides. Now add kasoori methi and the ginger garlic paste. Mix well and cook for about a minute. Add garam masala and mango powder. Here I add kitchen king/biryani masala/chicken masala whatever I have at hand; that's optional. Mix well and add tomato purée. Cook for another minute. Add half cup of water and mix well. Add salt, red chilli powder and turmeric powder. Mix and let cook on medium flame for about 5-7 minutes. 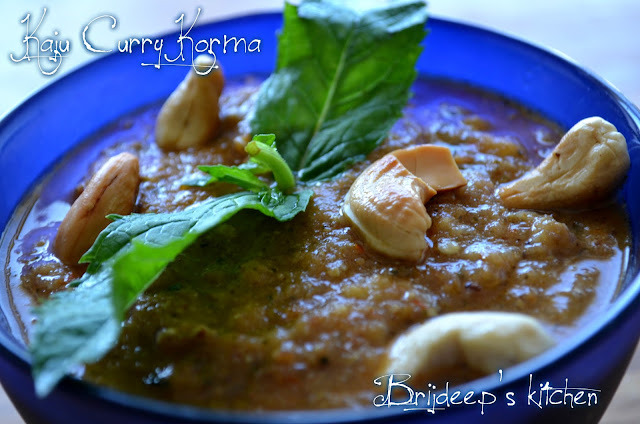 Turn off the heat, garnish with coriander leaves (optional), add the fried cashews and serve with roti/paratha/rice. Loved this recipe? Do leave a comment and/or your feedback if you tried this recipe. You talk about frying half the cashews. Where do other half go? Do you add them while making curry? Brideep - can i lightly fry the onions before i grind them so as to not have the bitter taste.? ?